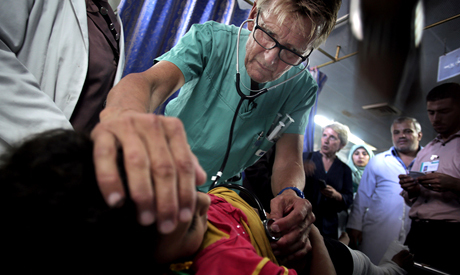 In a phone interview, Norwegian doctor Mads Gilbert described the six hours he spent in Al-Shifa hospital following the Israeli overnight bombardment of Shejaiya district as a "real massacre" and the worst night of his life. At least 60 people were killed and over 410 wounded in the Israeli shelling of Gaza's northeastern Shejaiya district overnight, medics said on Sunday. The onslaught came less than an hour after a two-hour humanitarian truce was called in the district to evacuate wounded Palestinians. Gilbert – who is also a well-known leftist activist – said that Sunday morning's death toll from the district stood at 40 persons – among them so far 14 children, 12 women and two elderly persons. Later, Gaza health officials announced the death toll had reached 50 in Shejaiya district – increasing to 60 persons an hour later. The screams of victims' families could be heard in the background while Gilbert described "tens and tens" of persons continually being brought to the hospital, with equal numbers lying in the nearby streets, according to eye witnesses he spoke with. "So many families have lost their beloved ones and they are simply devastated," he said. "What is shocking is that the Israelis bombarded apartment buildings line by line, regardless of whether there were people inside them or not, and many of those people are poor who cannot go anywhere," he said. The Israeli offensive against the Gaza Strip – which has killed over 400 Palestinians and injured over 2,000 since 8 July – extended into a ground invasion on Thursday and then mounted rapidly late Saturday night and into Sunday morning, targeting Shejaiya. "After midnight, the ambulances started to receive desperate calls from people trapped in their houses – with injured relatives, including children – and they were not able to go anywhere," he said. He said that there had been talks during the night between Gaza rulers Hamas, Israel and the International Committee of the Red Cross (ICRC) to let ambulances into the shelled district but that the discussions broke down, adding that there were reports of people who died in their homes while waiting for the ambulances to arrive. "Finally the ambulances decided bravely to go to Shejaiya in convoys at 2am," Gilbert said. "They kept coming and coming, carrying bodies," which he described as being in horrifying conditions. "I reckon it was the worst night of my life," he concluded. Thousands of Shejaiya residents have fled the district since early Sunday morning to escape the bombardment, part of the worst violence against Gaza in five years. Israeli Prime Minister Benyamin Netanyahu has blamed Hamas for using local citizens as human shields. I can't see how anyone can defend terrorist like IDF, they are sick and mentally ill. Their thirst for innocent blood is disgusting. It's another holocaust. Shame on people (if they can count as one) who supports babies killer aka Israel.